J J Watt is an American football player who began his professional career with the Houston Texans and plays in the defensive end position. The famous player whose caliber is rare in the world of athletics was allocated to the team on April 28, 2011, with the 11th pick in the first round of the years’ National Football League (NFL) draft. Even though the award-winning player is, for the most part, a defensive end, he also conveniently switches to any other position like a defensive tackle or offensive when need be. In 2014, the football star broke a track record in the history of NFL by becoming the first person to record two 20+ sack seasons in a career in addition to holding the team’s franchise records for both sacks and forced fumbles. Apart from being a renowned footballer, JJ Watt is also actively impacting the lives of young people through his charity foundation. Who Is J J Watt? The footballer simply known as J J Watt was born Justin James Watt on March 22, 1989, in Waukesha, Wisconsin, to Connie and John Watt. Despite the fact that he grew up in a family where neither of his parents had any relations to sports, Watt’s interest in athletic activities – hockey and football precisely – was evident right from when he was a child. He first started with hockey from the age of 4, playing for teams that traveled to Canada and Germany. However, he was left with no choice than to give up the sport at the age of 13 when it began to clash with his programme and also for reasons related to finance. Playing both football and hockey as a child helped J J Watt discover his true passion which he found out to be football when he was in fifth grade. Consequently, he focused more on the sport by the time he went to high school (Pewaukee High School) although he was also part of his school’s basketball, baseball, and track and field teams. Like a lighted candle that cannot be hidden in the dark, the young champion shone brightly in all the teams, winning letters in each of the sport. Even though Watt performed very well in other sports activities, it was still obvious that his area of strength was football as he won letters in football for four years and also won the Woodland Conference Player of the Year Award. In addition to this, he earned first-team All-State, All-County, All-Area, and All-Conference selections as a tight end and defensive end, all during his senior year. This boiled down to J J Watt being named the most valuable player of the team. After high school, Watt moved on to Central Michigan University, having received a scholarship offer from the institution. However, he spent just one year there and decided to let go of his scholarship rather than play offensive tackle as suggested by his coach, Butch Jones. The footballer went over to the University of Wisconsin-Madison, where he played in the defensive end position with the Badgers. While with the team, Watt was undeniably outstanding and as a result, he earned the Ronnie Lott Trophy (2010), was voted AP and Sports Illustrated second-team All- American, All-Big Ten first-team, and Academic All-Big Ten. To crown it all, J J Watts was also named the team’s most valuable player. Subsequently, Watt entered the 2011 NFL draft and came out tops in all the Combine categories except for one – the 40-yard dash. Following his amazing performance, he was selected in the first round with the 11th overall pick by the Houston Texans. J J Watt, who is the first NFL player to record two 20 sack seasons, began his professional football career by signing a four-year contract worth $11.24 million with the Houston Texans on July 31, 2011. Because Watt had been a force to reckon with in his first three years in the league, the Texans decided to ‘reward’ him with a 6-year contract extension worth $100 million. This made him the second defensive player to land a $100 million contract in the league history. The pact guaranteed him $51.9 million, including a $10 million signing bonus. This also brought his base salary for the year 2014 to $907,385 and $9.969 million in 2015. As at 2018, Watt is reported to be the highest paid Texans player with a $15 million cap hit. He was ranked 29th in Forbes 2015 list of the world’s highest-paid athletes and as of 2018, his career earnings are said to be $72.21 million, gathered from over eight seasons. His $15m cap hit for 2019 ranks 54th overall in the NFL. Off the field, Watt rakes in about $7 million (an amount which no other defensive player makes) from endorsements and sponsorship deals with companies like Gatorade, Ford, NRG, Reebok, Verizon, and American Family Insurance. In summary, J J Watt has an annual income of about $16.7 million and an estimated net worth of more than $100m. Often times, when players are in action, they get involved in major or minor injuries which sometimes do not affect their performance but other times may keep them away from continuing or participating in future games for some time. Despite being a champion in the game of football, J J Watt has had his fair share of injuries but has always bounced back. Just before his second professional season, on the 2nd of August, 2012 precisely, Watt dislocated his left elbow in a training camp practice, tearing all the ligaments in the joint. Although this caused him to miss all the preseason games, he, nevertheless, got back to make an appearance in the regular season and playoffs wearing an elbow brace. He was fine until he had a grade 3 abdominal muscle tear on the 29th of November, 2015. 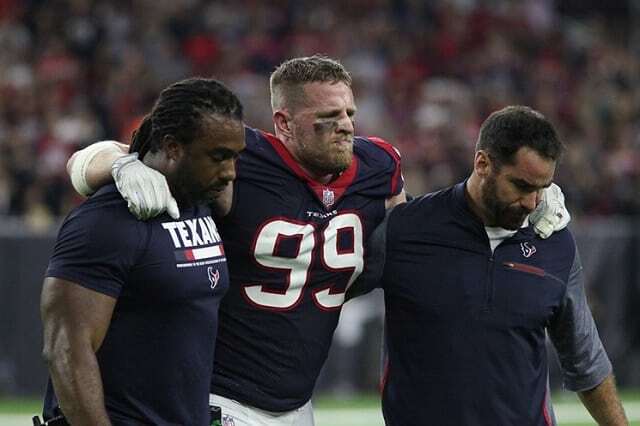 Watt had a partially torn right adductor longus, a completely torn left adductor longus, and left adductor pectineus in his inner thighs and groin, alongside partial tears in his left and right abdominals. On the 9th of December, 2015, he broke his hand during practice (Hand Metacarpal Fracture) but that did not stop him from playing that whole season. By the next season, Watt had to undergo surgery just before the start of preseason, due to a herniated disc in his back. He was able to return on time for the beginning of the regular season but only played three games before the need for another surgery arose thereby bringing the season to an early end for him and landing him on the injured reserve list. On September 10, 2017, Watt sustained an injury on his finger but continued playing with it even when he aggravated it. However, he was forced to stay off the field, missing the final 11 games on injured reserve as a result of a surgery he had on October 9th, due to a leg tibial plateau fracture. He has been hale and hearty ever since. Watt is not married but in a serious relationship with Kealia Ohai, an award-winning professional soccer player who plays for the Houston Dash. He got to know Kealia through his teammate, Brian Cushing, who is married to Megan, her elder sister. Although the duo obviously cares about each other, they have no plans of getting married any time soon because they want to build their carers. J J Watt, in a bid to give back to the society, founded a charity organization named the Justin J. Watt Foundation. The organization has been striving to provide after-school opportunities for youths, equipping them with what it takes to develop good character and pursue their athletic dreams. The foundation with the motto “Dream Big, Work Hard” was launched in 2010 with Watt’s mother, Connie, as the vice president.